LEGOLAND® California in Carlsbad is a 128-acre park geared towards kids ages two through 12. With over 60 family rides, "hands-on" attractions and shows, LEGOLAND California provides education, adventure and fun in this first park of its kind in the United States (the 150-acre LEGOLAND Florida, 45 minutes from Orlando and Tampa, opened on October 15, 2011). 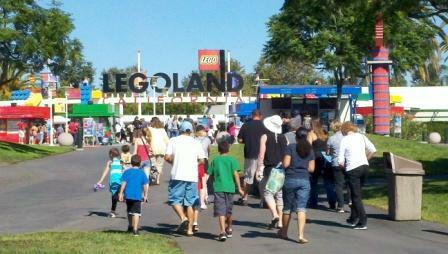 LEGOLAND is only a 2 1/2 hour drive from the Conejo Valley. There are over 15,000 LEGO® models in the park created from more than 35 million LEGO bricks. These models range from a Brontosaurus named Bronte (made of more than 2 million LEGO bricks) to a tiny rabbit in a magician’s hat in Miniland Las Vegas made of just four bricks. The park is divided into various sections in a full circle, with the amazing Miniland USA in the middle. Sections going clockwise from the front gate are The Beginning, Dino Island, DUPLO® Village, Fun Town, Pirate Shores, Castle Hill, Land of Adventure and Imagination Zone. My family's favorite treat are Granny's Apple Fries in the Castle Hill section. Apple fries with whipped cream and milk (or coffee in my case). Mmmmm. This is a no-brainer for anyone with young children. My kids are thrilled with this park up to at least ages 8 to 10. There are rides and activities for all ages and while geared towards kids, the park is certainly amazing for adults to experience too. Learn all about LEGOLAND California at california.legoland.com. Plan ahead and get discounts on your tickets. Currently AAA has discounts (either in advance or in person) as well as Metrolink Rewards. In addition to LEGOLAND, the world's first LEGOLAND Water Park opened on May 28, 2010. It is located at the north end of LEGOLAND® California adjacent to Fun Town. The entrance is located between the Factory Tour and the Adventurer’s Club. There is a 45 foot tall water tall with 4 slides and all sorts of fun water play. Only a $12 upgrade (as of October 2011) to LEGOLAND admission. Additionally, the SEA LIFE Carlsbad Aquarium opened adjacent to LEGOLAND. I walked through quickly with the family. Pretty cool though not nearly as substantial as the Aquarium of the Pacific. Gotta see it though if you go to LEGOLAND. You can buy a park hopper pass or a separate ticket. More info at www.visitsealife.com/California.